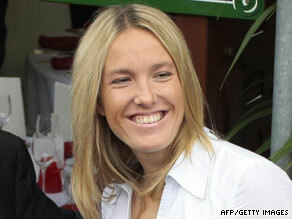 (CNN) -- Justine Henin is following in the footsteps of fellow former world No. 1 Kim Clijsters by returning to competitive tennis. Justine Henin held the women's No. 1 ranking for a total of 117 weeks before quitting in May 2008. The 27-year-old, who retired 15 months ago, announced on Belgian television on Tuesday evening that she will compete on the WTA Tour next year. Henin, who has won seven Grand Slam titles, ended weeks of speculation by confirming rumors that she was ready to make her comeback. "I'm really happy and deeply moved to be able to announce tonight that I'm coming back to competitive tennis," Henin told RTL-TVI. "These past 15 months have been enriching, but there is a flame that has been re-lit. I thought it had been put out forever." The announcement comes just over a week after fellow Belgian Clijsters capped her comeback by winning the U.S. Open for the second time. Henin will play exhibition tournaments in Belgium and Dubai later this year before the 2010 season starts ahead of January's Australian Open, which she won in 2004 and then finished as runner-up in 2006. She had held the women's No. 1 ranking for a career-total 117 weeks when she announced her retirement in May 2008, citing injury problems and a desire to pursue other interests. Her coach Carlos Rodriguez said Henin was determined to win Wimbledon for the first time, having twice been runner-up at the grasscourt Grand Slam event in England. "I swear I was extremely surprised," he said. "I'm happy because at the end of the day it's what she loves. She has entrusted me [to be her coach] once again and I will try to never let her down. "I'm very happy to be helping her to restart her new life. It's a super challenge for her. The desire to win Wimbledon is one of the main reasons she's come back, and I'll do everything to help her do it." Henin had previously insisted that she would not return to the sport. "A new future is ahead and I won't go back on this decision," she said last year.